Spring may have sprung but there have been no shortage of cold nights best spent huddled up with a warm drink – and The Reds Shop’s got the perfect accompaniment. 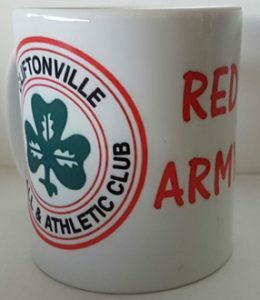 We’ve recently taken stock of two new Official Cliftonville FC Mugs, which are on sale from both the Shop at Solitude as well as online. The Huddle Mug and more plain ‘Red Army‘ cup are both available for just £7 and you can call into the Shop at Solitude between 7.30-8.30pm every Thursday (and any home matchday) to check out the goods up for grabs, including our popular Leisurewear Range. Supporters can, in addition, purchase Tennent’s Irish Cup Semi Final tickets from the Shop this evening as well as before, at half-time of and immediately after tomorrow night’s Danske Bank Premiership fixture with Ards, while online sales can be completed by visiting Ticketmaster.